Some things just go together, like peanut butter and jelly, chips and guac, and, now, Sriracha and Lexus. 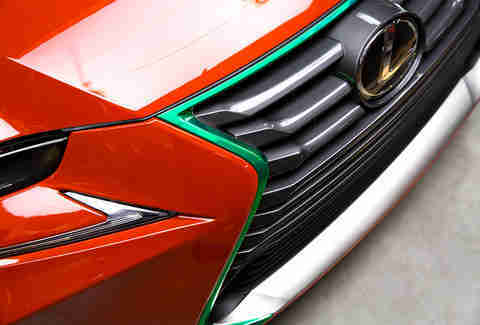 The luxury car company recently partnered with Huy Fong Foods, creator of the world’s favorite spicy condiment, to create a one-of-a-kind, 100% drivable, luxury homage: the Lexus Sriracha IS. Finally, definitive proof that Sriracha goes with absolutely everything. 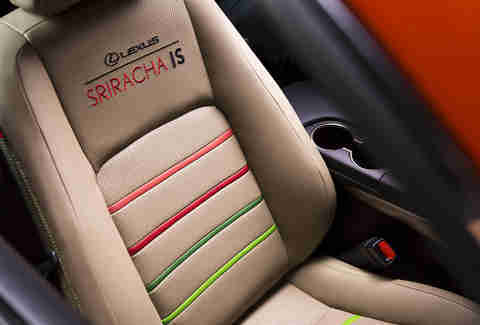 So what makes a Lexus IS a Lexus Sriracha IS? There is Sriracha liquid in the steering wheel, a “Sriracha hot" heating system, and a “Sriracha mode” driving option that allows for faster gear changes -- for when you’re in a rush to pick up your to-go order at the ramen place. Nods to the famous bottle include hand-embroidered rooster emblems on the headrests, and green-tipped exhaust pipes. Should you encounter a Sriracha emergency and need 43 bottles stat, the trunk is filled with them. Phew. And, of course, it’s bright red. Lexus and Huy Fong Foods enlisted West Coast Customs (yes, the guys of Pimp My Ride fame) to create the custom Sriracha Red paint, which is inspired by the sauce in its purest form: in the bottle. It’s also the same color as when the peppers are mashed in the factory, then refined and bottled. There are also some gold flecks in there, to mimic the look of chili flakes. Sadly, there is only one Lexus Sriracha IS in existence, but the good news is, you can catch it at festivals and auto shows throughout the year. Beneath the spicy trimmings, it’s still a Lexus IS, and celebrates the launch of the new 2017 model. Read more about the inspiration behind the greatest mash up since fries and milkshakes here. *The Lexus Sriracha IS is not for sale. Sriracha and the Lexus IS sold separately. Professional assembly required.